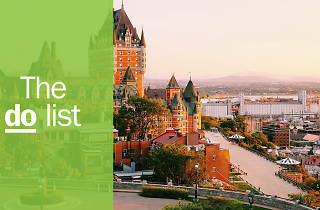 Many Canadians would say the heart of French culture is in Quebec City. The narrow streets of the old town – a Unesco World Heritage Site dating back to 1608 – are filled with museums, boutiques, restaurants and plenty of European charm. It’s the only fortified city in the Americas north of Mexico and its extremely walkable. 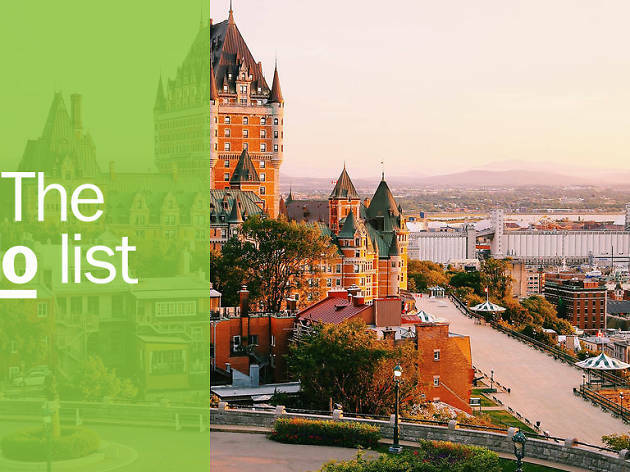 On foot is by far the best way to enjoy all of Quebec City’s rich history – just remember when planning your route that there’s a large cliff separating the upper and lower towns. What is it? The most photographed hotel in the world just celebrated its 125th anniversary. Fairmont Le Château Frontenac is an important historic landmark, perched on a headland overlooking the St Lawrence River. Why go? King George VI and Queen Elizabeth stayed here in 1939, while the hotel hosted various world leaders during World War Two. Even if you’re not staying here, you can request a historic tour to learn all its secrets, then head to the 1608 wine and cheese bar for cocktails and people-watching. What is it? 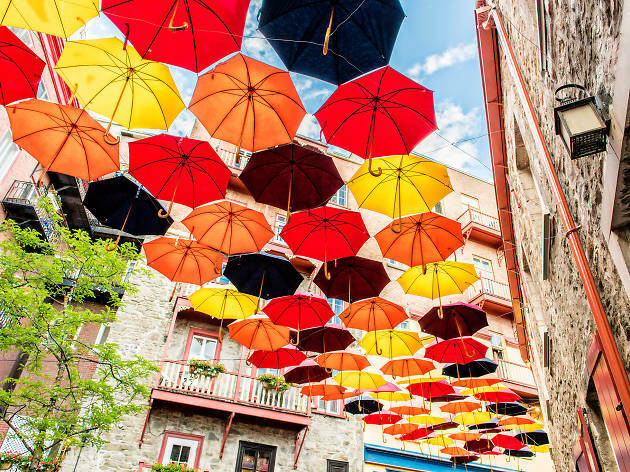 The narrow Rue de Petit-Champlain in Old Quebec, with its brightly painted shutters and old French-style architecture, was voted Canada’s most beautiful street in 2014. Why go? Stores are inevitably quite pricey, but there’s plenty of enjoyable window-shopping to be done if you’re on a budget. At the top of the street you’ll find the famous Escalier Casse-Cou (Breakneck Stairs), the oldest stairs in the city and a key connection between the Upper Town and Lower Town. What is it? 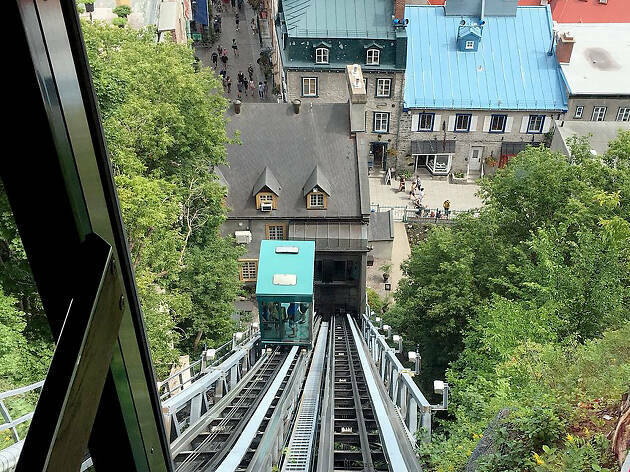 The Old Quebec Funicular is a fun cable car connection between the upper and lower parts of Quebec. It operates 7 days a week, 364 days a year. Why go? This is by far the most fun you can have for $3 in Quebec City. 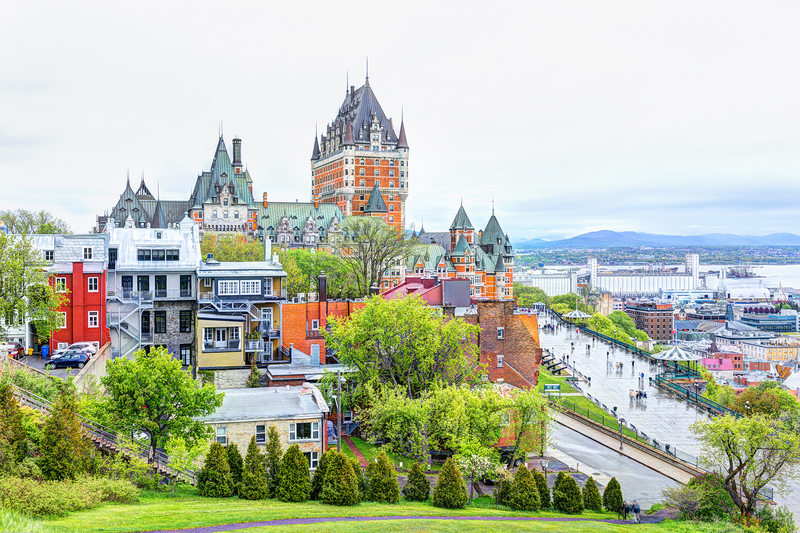 As you ascend or descend this steep cliff, look out of the big glass windows over the roofs and streets of the lower part of Quebec City, and the river. What is it? Old Quebec restaurant serving gourmet burgers and poutines. It’s the most affordable lunch you’ll find this close to the heart of town. Why go? Quebecois food is known for being rich and heavy, and no dish captures this better than poutine, which is, in its most essential form, a hot mess of potato, cheese curds and gravy. 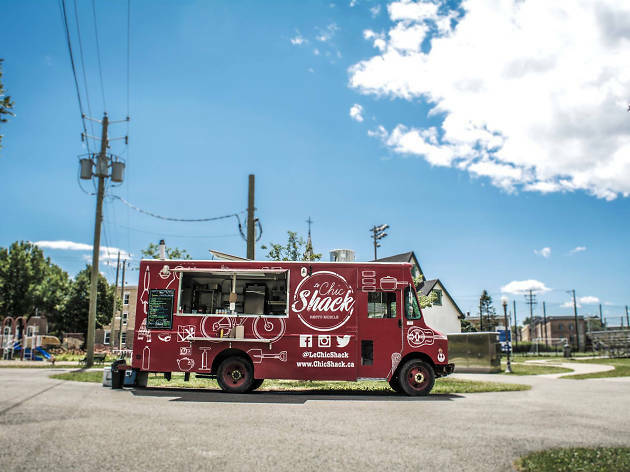 Head to Chic Shack and order la braisée 2.0 poutine, topped with red ale-braised beef, parmesan, pickled onions, horseradish aioli and fresh herbs. What is it? 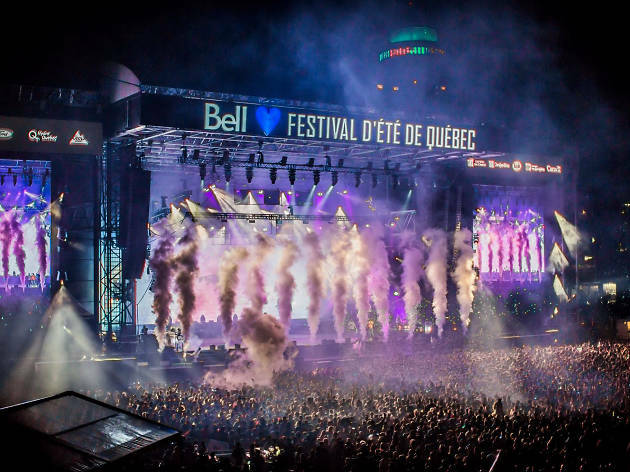 The Festival d’été de Quebec is Canada’s largest outdoor music event, and Quebec’s answer to Glastonbury. Why go? Line-ups are diverse, with previous acts including Lorde, Red Hot Chili Peppers, Unknown Mortal Orchestra, Flo Rida, DJ Shadow, Backstreet Boys and MGMT. Much of the festival takes place on the site of a pivotal battle between the French and English in the mid-1700s, during the Seven Years War – now it’s the much more fun 240-acre Plains of Abraham park. What is it? 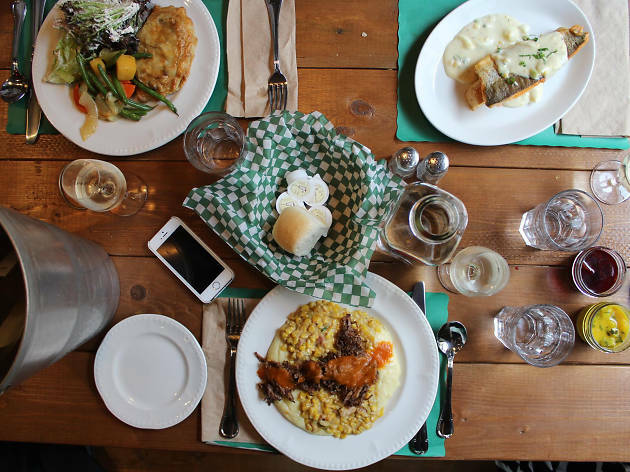 La Buche has all traditional Quebec classics covered: chow down at the long communal tables while taking in live music and the fun atmosphere. Pro tip: go light on lunch, Quebecois food is hella hearty. Why go? Try the tourtière, a meat pie with local venison, pork and beef served with fruit ketchup, or the seared foie gras with poor man’s pudding, drenched in maple syrup. What is it? 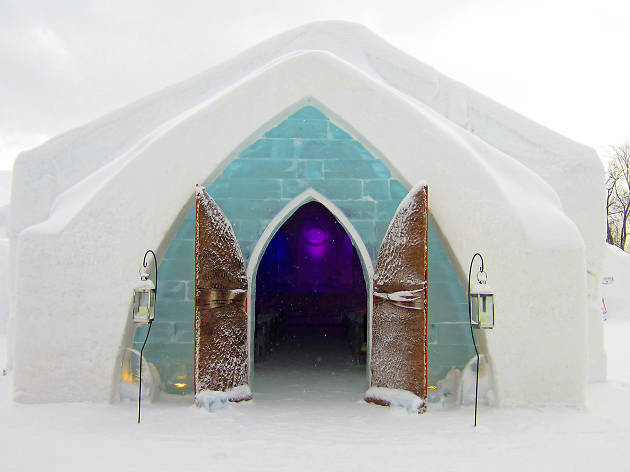 The only ice hotel in North America melts away every year to be rebuilt again the next, just 4km north of Quebec City. The inside of each suite is beautifully carved out of ice and snow, and the mattress sits on a raised ice block for you to cozy up on top in a Nordic sleeping bag. Why go? Put on your hat and mitts to explore the magical spot that inspired Elsa’s palace in Disney’s ‘Frozen’. 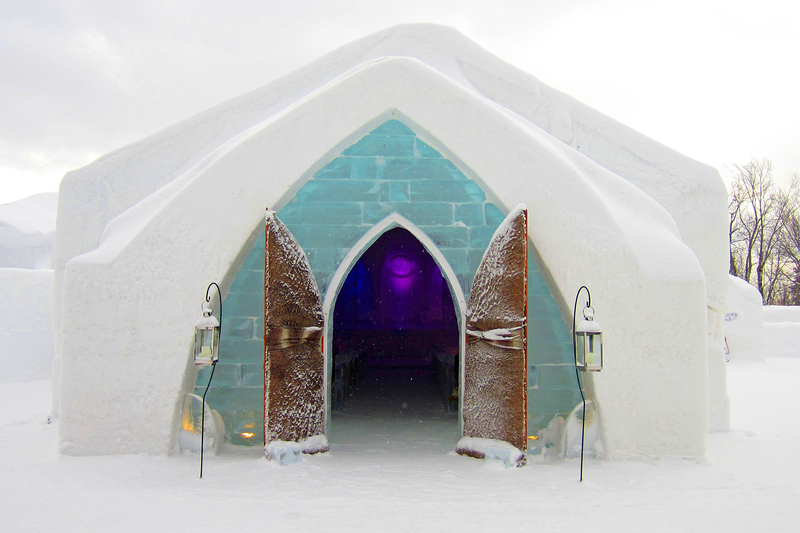 If you don’t feel like sleeping there, take a tour and have a cocktail at the Ice Bar – in a glass made of ice. What is it? 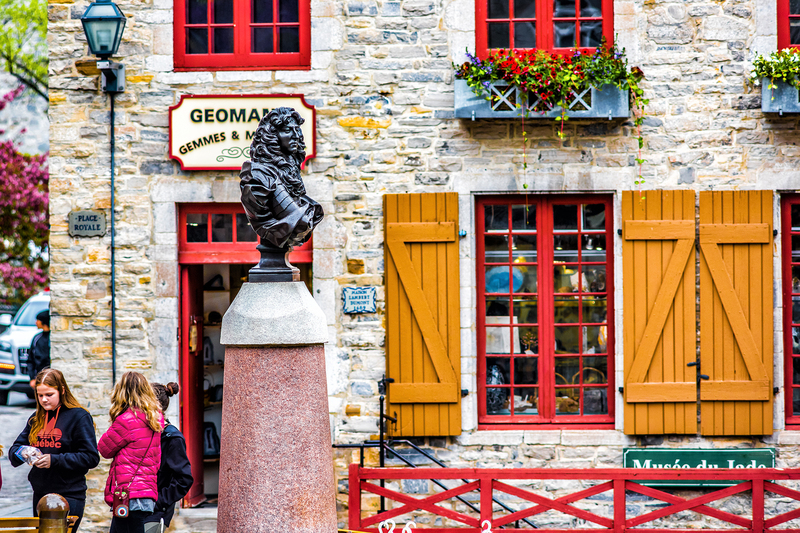 This cobbled square is the site of the very first French settlement in Canada established by Samuel de Champlain in 1608. Why go? You’ll find the oldest stone church in North America, the Notre-Dame-des-Victoires here. 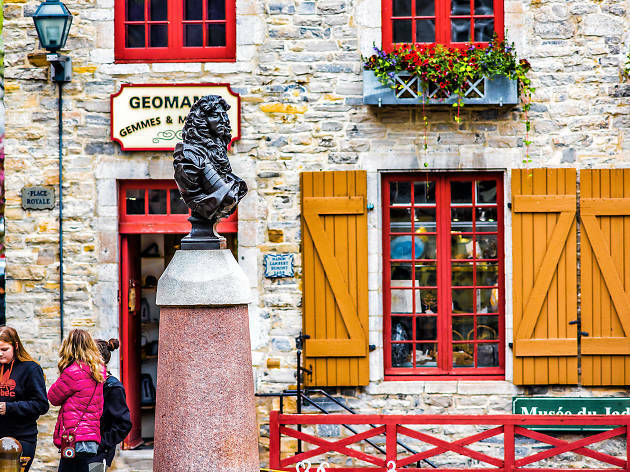 Sit on a bench in the center to admire the old stone homes, and don’t miss the enormous mural just steps away that recounts 400 years of Quebec City’s history. What is it? 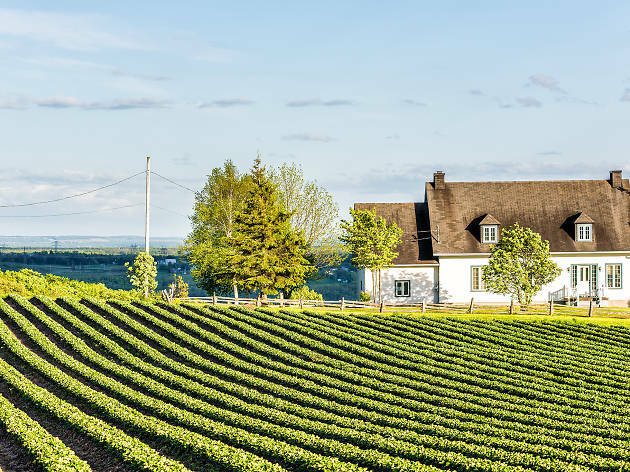 This little island, just 15 minutes from downtown Quebec City, is full of artisans, farm stands, centuries-old villages and heritage homes. 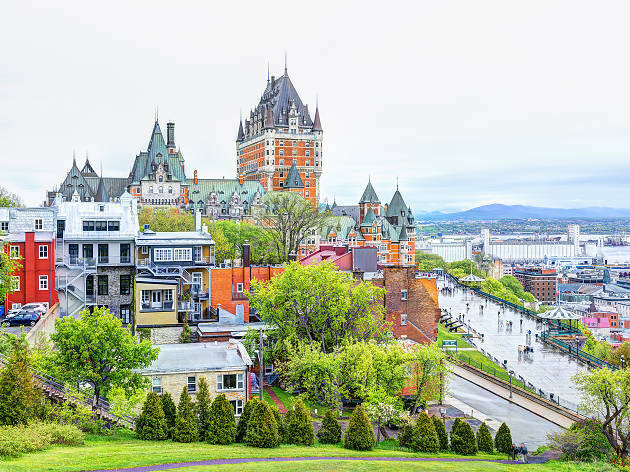 Step back in time to eighteenth-century rural Quebec with a bike ride around this charming island. Why go? So you can stop to meet the locals and pick your own apples in the orchards near Sainte-Famille, the island’s oldest parish. What is it? 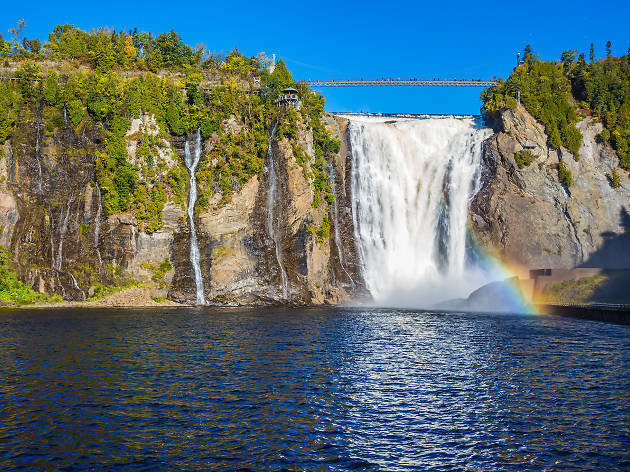 This spectacular waterfall is more than 30 metres higher than Niagara Falls. Why go? Take the cable car up the cliff to the panoramic walk, then test your fear of heights as you cross the suspension bridge directly above the falls. You can also rope in and zipline 300 meters across the falls either solo or side by side with a partner.